The Shambhala Lineage Tangka was presented to the worldwide community on Shambhala Day 2016. This tangka holds the blessings and aspirations of the Sakyong lineage, and thus the blessings of profound wisdom, the Rigdens, and all deities and dralas of Shambhala. The Sakyong lineage encompasses the lineages of Gesar, of India and Tibet’s mahamudra and Dzokchen teachings, and the ancestral sovereigns. 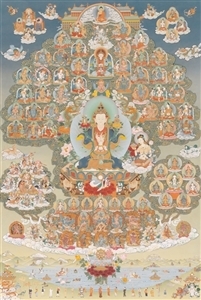 The Shambhala Lineage Tangka depicts over ninety deities, including all the Rigden kings and queens of Shambhala. Noedup Rongae, Artist to the Kalapa Court and a treasure to both Shambhala and the Himalayan Buddhist world, painted the tangka over the course of nearly twelve years. His artwork can be found in monasteries in Asia and throughout the West. High quality reproduction of original tangka painting by Noedup Rongae. Larger sizes available by Special Order from info@kalapamedia.org. Guidelines for framing and displaying the Shambhala Lineage Tangka can be found at Extended Information (above). We are pleased to share with you the guidelines for the display and presentation of the Shambhala Lineage Thangka print in your home or centre. 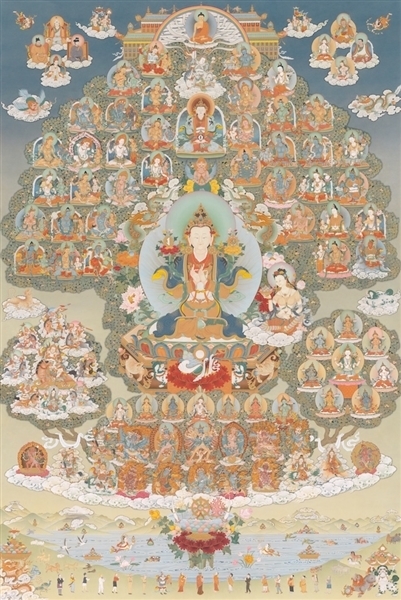 The Sakyong has said that this thangka was created to support people’s practice and our sense of connection to the continuing lineage of Shambhala. It was painted by master thangka Artist to the Kalapa Court, Noedup Rongae over the course of nearly 12 years, with close involvement from the Sakyong at every stage. The thangka depicts all of the Rigden kings and queens of Shambhala, along with over ninety deities. v The Shambhala Lineage Thangka should be displayed in a place of honour, either in a main or auxiliary shrine room. It is good to give careful attention to the placement of the thangka, even considering the possibility of creating a carved ornament to place above it, creating a molding border around it, or constructing a shelf below for incense offering. v If you are purchasing the thangka for personal use in your home, it should hang in your shrine room next to or over your shrine, with a gold frame. v Shambhala Meditation Centres should have the print framed elegantly in a substantial gold frame with coordinating mat or with a brocade border. o If using 2 colour mat, a wider ivory mat closer to the frame with narrow warm red inner mat looks quite good. o If using a brocade border, we suggest red or dark blue brocade with a small subtle pattern that won’t overwhelm the thangka image. v If the thangka is displayed in your centre’s Main Shrine Room, it could hang next to the main shrine, or on another wall that is free of clutter. Please do not hang the thangka on the back wall of shrine room where people would normally sit with their backs to the image. v If hung in an auxiliary shrine room, it can be the main shrine image hanging above the shrine, such as in a Sadhana or Vajrayana Shrine Room. v It is not necessary to keep a veil over the Shambhala Lineage thangka. v If the thangka is being purchased for a Shambhala Meditation Centre, it would be good to place it with some ceremony for your members to understand the meaning and significance of this image. o During that community event, you could unveil the Shambhala Lineage Thangka. This can be accomplished by hanging a simple piece of silk elegantly over the image like a veil or curtain, and then during your event, open or remove the veil to reveal the image. o You could play gyaling (Tibetan horn) music, or Japanese flute music, or other inspiring classical music when you reveal the image, and then chant the Shambhala Lineage Chant together x3 or x7.